Overview - Two fishing fanatics get in trouble when their fishing boat gets stolen while on a trip. Every now and then I'll come across a title in my review pile and suddenly think to myself, "Hey, I sort of remember that existing." 'Gone Fishin' is one of those discs. An utterly forgettable remnant of the late 90s, the film is so unremarkable that it largely exists only as a half remembered fragment in most audiences' minds. "Remember that silly comedy with Danny Glover and Joe Pesci? You know, the one where they go fishin'? Kind of? Yeah, me too. No, I don't mean that scene in Lethal Weapon 4!" In truth, I do have a foggy memory of seeing the film's trailer as a kid, and I must admit that my ten year old self probably thought it looked kind of fun. When I popped in the disc I was totally open to being wowed. Perhaps this 90s oddity was really an underappreciated comedic gem. Unfortunately, those hopes were almost immediately dashed. This flick is everything one might expect from its ridiculous cover -- minus the dubious promise of "Big Laughs," of course. Actually, it's somehow worse. 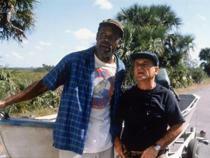 Lifelong friends Joe (Joe Pesci) and Gus (Danny Glover) head down to the Florida Everglades for a relaxing fishing trip. Unfortunately, as soon as the bumbling pair reaches the Sunshine State, trouble starts to follow them. After their car is stolen by a potentially murderous criminal, the duo embark on a series of increasingly exaggerated yet still totally mundane misadventures. All they want to do is go fishin', but they're going to have to overcome insurmountable odds to reach their goal. A cartoonish exercise in asinine comedy, the movie attempts to find laughs through larger-than-life situations and the buffoonish behavior of its main characters. Unfortunately, the humor just doesn't work. As crazy as some of the situations get, they somehow remain totally lifeless and boring. There is literally no imagination or wit in any of the increasingly stupid stunts or lines of dialogue. To give you a taste of what the filmmakers have in store for your funny bone, here are a few examples of scenarios that are supposed to make viewers chuckle: Joe Pesci and Danny Glover wrecking several boats, Joe Pesci and Danny Glover trying on jackets that don't fit, Joe Pesci and Danny Glover kicking an alligator, Joe Pesci talking in an extremely irritating voice, Joe Pesci getting hit by lightning, and Danny Glover attempting to blow dry his hair while sleepwalking (OK, that part was oddly amusing). Even ignoring the terrible jokes, the story itself is horrendous, with a thin, clunky plot. The script lacks any kind of natural flow, and the whole thing just feels like it was slapped together during the day of shooting. What's worse is the fact that Pesci and Glover don't even manage to muster any real on-screen chemistry. I admire both actors and think they did great work together on the 'Lethal Weapon' series, but here they're pretty painful to watch. Their characters are nothing more than annoying simpletons with no real personalities. Their clumsy, childlike behavior and cartoonish misadventures are supposed to endear them to the audience, but I just wanted them to go fishin' already so the damn movie could end. While plenty of blame for the film's flaws likely lie with director Christopher Cain, I place most of the responsibility on screenwriters Jill Mazursky Cody and Jeffrey Abrams' shoulders. In fact, I've got a feeling Jeffrey Abrams is the real culprit here. I don't know who that guy is, but if I had to guess I'd say he never got another script made after this awful mess. Actually, I'm going to go look him up on IMDB right now. Hold on a sec. OK, let's see -- what the blerg!? J.J. Abrams! J.J. Abrams co-wrote 'Gone Fishin?!' Hmmm, well that is… troubling. I guess all writers have at least one massive piece of crap in their filmography. Keeps them grounded, I suppose. I mean no offense to any who might actually be a fan of this flick, but for the life of me I just can't understand why this movie is getting a Blu-ray release at all. It's a fairly obscure, forgotten, unloved, and frankly terrible attempt at a comedy. I doubt there was any real demand for this disc and at a current price of $5.99 on Amazon (I actually saw it as low as $3.99 at my local BJ's) they're practically giving it away. Even at a bargain price like that, I still can't recommend the movie, and I think that pretty much says all that needs to be said. Maybe I'm just missing something, but I found the whole experience to be too annoying, dumb, and boring to offer any real entertainment value. 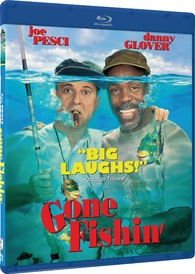 Mill Creek Entertainment brings 'Gone Fishin' to Blu-ray on a BD-25 disc that comes packaged in a keepcase. After some logos and warnings, the disc transitions to a standard menu. The packaging indicates that the release is region A compatible. The movie is provided with a 1080p/AVC MPEG-4 transfer in the 1.85:1 aspect ratio. Though occasionally problematic and uneven, the film looks decent enough. The source is in good shape with no major signs of damage. Light grain is visible in some shots but there are also instances of unwanted noise mixed in from time to time. With that said, a few scenes exhibit a slightly waxy quality in facial features that might indicate a light use of DNR. Unfortunately, detail is mostly lackluster and the image often has a faintly blurry quality. A few close-ups manage to look pretty good, but as a whole the film lacks any real pop or depth, with some sequences looking more like unconverted standard definition. Colors and contrast appear a bit faded during indoor sequences, but outdoor scenes set in the Florida Everglades offer decent vibrancy. Black levels are nice and deep throughout. With a few technical inconsistencies and an overall mediocre sense of clarity, the movie looks OK, but never impressive. The video gets the job done but fails to really demonstrate any of the major benefits of the Blu-ray medium. The audio is presented in an English DTS-HD MA 5.1 track along with Dolby Digital 2.0 Spanish and French tracks. Optional English subtitles are also included. To be honest, I really wasn't expecting much from this mix, but I was pleasantly surprised by the audio's solid design work. Speech is crisp and clean throughout. The cartoonish nature of the movie leads to a fairly lively atmosphere with some exaggerated effects work. Explosions, squealing tires, soaring planes and speeding trains all come through well, filling the speakers with bursts of energetic audio. Surrounds offer a decent sense of ambiance, properly replicating the nature sounds of the Florida Everglades. The score features solid range and low frequencies carry a welcome kick during aggressive moments. 'Gone Fishin' actually sounds pretty good. The mix certainly won't be winning any awards and the design lacks any real semblance of nuance or artistry, but the effects work does bolster the silly content well with no technical hiccups or balance issues. 'Gone Fishin' is a mostly forgotten late 90s oddity that should probably just stay forgotten. The humor is utterly pedestrian, and even the usually likeable pairing of Joe Pesci and Danny Glover fails to offer any real entertainment value. The video transfer is serviceable yet totally unimpressive, but the audio is actually pretty solid. With only a trailer, supplements are essentially nonexistent. Even at its miniscule price, this is a disc that most audiences will want to avoid.